He has three epic quality level 25 pets on his team. The daily is account-wide as expected, meaning you can only complete it once per day across your account (just like any other pet battle dailies). Edit: Be sure to change your attacks to fit the opponent before-hand since it costs you a Darkmoon Token each attempt. I cant battle him i have coins so why not! 1. Fezwick (beast) always goes last in the line-up, with it being either Judgement (magic) or Honky-Tonk (mech) first, so choose your first-slot pet accordingly to avoid wasting a turn swapping. 2. It costs a Game Token *each time* you challenge him, so if you fail, or if you're like me and prefer to chicken out and re-challenge until the order suits you better, be prepared to blow through more than just the one token. 3. There is no stable master on the island, so if you're struggling to defeat him first go, make sure you either choose to do it on a character that has a bushel of Pet Bandages, or do it as soon as you hit the island so that you can do the other dailies while waiting on the Revive cooldown. This daily rewards Darkmoon Pet Supplies, which contains currency: Darkmoon Prize Ticket x5. This adds up to an extra 35 tickets every Darkmoon Faire, as the quest is a daily (as mentioned above, only completable once per account, so make sure you complete it on the character that you'd like tickets on!). If you're having problems being chain-stunned by Fezwick, the irritating little monkey, consider using a pet that has Arcane Storm. Fezwick sometimes get the "endless attack" bug after he stuns you. How I hate that damn monkey. Beat him pretty easily with 25 Disgusting Oozeling (Magic), 25 Clockwork Gnome (Mech), and 23 Frosty (Undead). Not terribly hard. I use Landro's Lil' XT, Frosty's Collar, and I don't even need a third pet. Judgement is a Magic pet. Honky-Tonk is a Mechanical pet. Fezwick is a Beast pet. 1. Singing Sunflower against Honky-Tonk and Judgement. This beautiful singing flower is really hard to kill! Start up with Sunlight, then get Photosynthesis up and running, and then strike with the Solar Beam. After that just use those abilities to finish the mechanical. Then comes the Judgement, which you should be able to get to half of it's health before the Sunflower dies. 2. Celestial Dragon against Judgement and Fezwick. We really hate that monkey, don't we? Finish the Judgement with dragon's Breath and Starfall but just before it dies change the weather to Arcane Storm, so the monkey won't get the chance to get you stunned. Fight that beast as long as the dragon is alive but remember about the fun part that's coming next..
3. Whatever pet you want to level up! The end of Fezwick. The best part of the battle! Remember to get that little guy into the battle before your Celestial Dragon finishes the monkey. Just remember to have Arcane Storm on. Or let the dragon almost finish the monkey and then the low-level pet kills it and gets all the glory! And XP. Lot of it. Edit: Actually, the best way may be to start the fight with the low-level pet. It depends on it's level to be honest. Another potential pet to utilize against Jeremy is the Mechanical Pandaren Dragonling, if you can find a Mechanic stone to make it rare. It is faster than all three of his pets and can completely smear Judgment all over the place. It's also quite useful against Honky-Tonk with Decoy, which will block the second part of its devastating combo attack. I finally got a team that can beat him fairly consistently: Mr. Grubbs, Corefire Imp, and Emperor Crab (all rare quality). Obviously all these pets have self-heals, I don't see how this fight is doable without them. I didn't even need to put Anubisath into battle. Dark Whelpling easily take care of the Darkmoon Eye and gave enough damage to Honky-Tonk. Pandaren Fire Spirit finished both Tonk and the monkey. Fossilized Hatchling works really well against Judgment (the floating eyeball). Its selfheal is a big help. I use Dragonbone Hatchling against Honky-Tonk because of his life-off ability and finally Azure Whelpling against Fezwick (the monkey). If his Arcane Storm prevents Fezwick from stunning him and if his Surge of Power hits, it is a great finisher. I have been using this team against him since the daily first came available and I would highly recommend it to anyone having trouble beating him. This battle's difficulty now seems to scale with your character level - maybe because of the new XP gain in 5.2. On my 82 druid this is a MUCH trickier fight than on my 90 hunter. Celestial Dragon to start against Judgment using mainly Breath, and Ancient Blessing for a nice heal. Pandaren Fire Spirit with Burn, Immolate, and Conflagrate to burn thru http://www.wowhead.com/npc=67383. As Fezwick comes out, Be prepared for him to stun your Pandaren Fire Spirit out the gate. Just switch to a battle-stone upgraded Personal World Destroyer and you can basically just spam http://www.wowhead.com/petability=384. This setup works like a charm as I'm sure many other do! Hope this helps someone! Be sure to use Frost Shock first then Deep Freeze on his Tonk so you reduce it's speed. Just had Fezwick stun me even though I had Arcane Winds up, something is wrong. Ticket has been submitted, waiting on response. Can anyone confirm if this is a way to earn a little valor points on non-level cap characters? Patch 5.3.0 currently awards 5x Valor Points for completing this quest to characters at least as low as level 86. This is also affected by Valor of the Ancients. I completed it today on my 86 Paladin and received 7 VPs (5 VP normal + 5*0.5 = 2 VP from the valor buff). Many battles changed with 5.3, but I don't think Jeremy did. and the battle was easy. All were (or upgraded to) rare and level 25. Oasis Moth, Emerald Shale Hatchling, Amethyst Spiderling 1 shot. fezwick just repeatedly stunned my pet even with arcane storm up. I've finally been mostly consistently getting through the other two with Celestial Dragon and the Sunflower, but no matter what pets I try with fez, he keeps stunning me and I can't get enough hits in to down him, seriously frustrating. also, no matter how many times I forfeited or even dropped and reaccepted the quest judgement is ALWAYS first now. next he did Honky-Tonk. the thing about the razortooth is its both weak to its attacks AND all three of its abilities (jolt, paralyzing shock, lightning shield) is strong against. only problem is all three have cool downs, so you have to do them in a certain order (i go jolt, shield, jolt, shock, jolt). Well, another pet battle quest that trials can get but can't complete! The first one being Learning the Ropes. 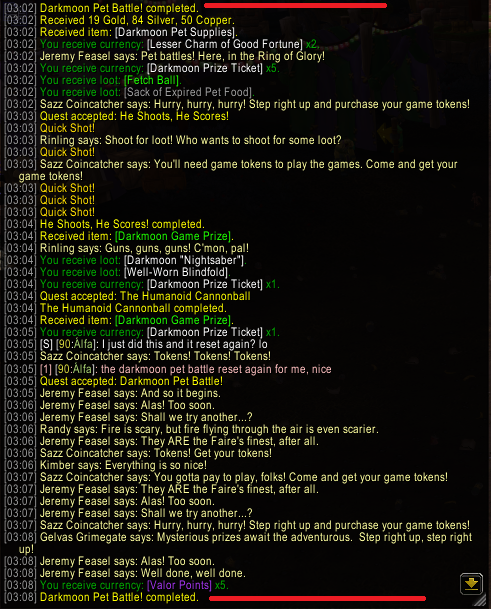 To make things worse, if you talk to Jeremy Feasel and try to start a pet battle, it will display the usual message of "failed to create pet battle" but you will still lose a Darkmoon Game Token! I was originally looking to replace the 25 fel flame with a dragonkin for Judgement, but the only one high enough is my Wild Jade Hatchling, which hardly has any dragonkin abilities. Took a chance with the 19 Fel Flame and was pleasantly surprised that it paid off. If you're like me and have no store bought or TCG pets, I suggest using (all level 25 of course) a rare Emerald Proto-Whelp (Breed P/B) or an Arctic Hare (Breed B/B) against Judgement, a rare Electrified Razortooth (Breed B/B) against Honky-Tonk and a rare Tainted Moth (Breed H/S) against Fezwick. Ancient Blessing when on low health. Dodge - I suggest you use this or Burrow whenever Judgement is about to use Darkmoon Curse. Jolt - Start with this ability. Cocoon Strike - Use this whenever Fezwick is about to stun your pet. One last thing, the moth, for Fezwick is supposed to be faster. So if moth goes under 50%, losing the 50% extra speed flying pets get when above 50% just concede and try again because the monkey will most likely kill your moth. Does not grant rep. Don't bother doing if you're there for rep only. Does anybody know why July is the last darkmoon faire in the ingame calendar? Every other event except the faire is noted there throughout the year. Not much time to farm the pet anymore? I did this right after reset, did another darkmoon daily and came past the battle area and noticed the quest was up again. Not sure how it happened, but I was able to do it twice that day. I have a team that absolutely smashes this guys pets. Judgement will always be his first pet, so you should start with Infinite Whelpling. Round 4: Tail Sweep - Judgement Dies & you have the dragonkin buff. Honky Tonk then enters the battlefield, use Early advantage, with the dragonkin buff it will hit like a truck on steroids. After your infinite whelpling dies, bring out Lil Ragnaros. Honky Tonk will die during the course of either of these combination of abilities. My blossoming ancient can almost solo this team. Just keep sunlight and photosynthesis up and clobber away with ironbark. Keep another pet in the wings to finish off the monkey when the ancient dies. Emerald Proto-Whelp: Emerald Bite, Emerald Presence, Emerald Dream. Here is my 2 Pet Strategy for Jeremy Feasel from the Darkmoon Faire, you can take him on ever day of the week that the Darkmoon Faire is in Town. I used the Mechanical Pandaren Dragonling & the Cogblade Raptor with my carry pet in the 3rd spot. Real simple fight her, open with the Mechanical Pandaren Dragonling using Thunder Bolt, then Breath till Judgment is dead. When Honky Tonk enters use Decoy then Thunder Bolt when is comes off cool down and Breath till you die or Honky Tonk dies. Bring in your carry pet and take him right out, no move is necessary since your carry didn't start the fight. Bring in the Cogblade Raptor and use Batter till the Tonk is dead. When Fezwick enters use Batter as its very strong vs him till he is dead. Simple as that easy peasy. You get like 4500 xp for a carry pet I believe. Attacks from me were button 1 throughout. Not pretty but took them first attempt. Use Zep thunderbolt on cd to soften them up. Used repair about the 2nd turn of gnome after honky tonks big hit. Gnome won and got swapped after the stun. Kept plating up and metal fist all the way with nest guardian. Start with Decoy and then Thunderbolt; use both on CD. Breath to attack until the Dragonling dies. Swap in the Zeppelin. Thunderbolt and then Bombing run. Again use both on CD with Missile as filler attack until Zeppelin dies or is forced to swap out. Clockwork Gnome - kill it however you like. Repair if/when necessary. Anubisath Idol will open with Sandstorm -> Rupture and then spam Crush until either you or the first pet dies. Continue this rotation for Anubisath Idol. Defeat Jeremy Feasel in a pet battle. Are you prepared to test the mettle of your pets...? I must say, good show!